We’re launching a new monthly feature here today and we’re excited to share it. Gluten-free Brazilian cheese bread. Great-tasting gluten-free, raw, and vegan snacks. Delicious alternatives to refined sugars. Healthy boxed gluten-free meals, simple to make in time for dinner. And a monthly subscription service that delivers great gluten-free food to your door. Over the years of writing this site, we have learned how much some of you like our recommendations for companies that understand the need for good gluten-free products, companies that produce food or experiences that safely satisfy. We want to start giving you more recommendations. Welcome to Gluten-Free Girl and the Chef Recommended. We love our long-term sponsors, whom we consider partners in this work we do. You can see the ads for those sponsors on our site right now. However, we receive packages every day from smaller companies just starting out or regional companies that a national audience might not know. As small business owners ourselves, we want to encourage the success of the companies we love. That’s why we are now doing a monthly round-up post of food and services we love right now. These are paid sponsorships, but we only accept on as sponsors companies who make food we truly love. These are foods we would buy at the grocery store, if we could. And we think you should know about them. We’re crazy about Brazi Bites in this house. These little Brazilian cheese breads, also known as Pão de Queijo, are crunchy on the outside then turn to a delicious springy chewiness inside. The mix of cheeses make for a wonderful, fleeting taste of cheese without being too rich. Tell the truth, there are plenty of recipes on the internet for these and I’ve made a few. The only flour required is tapioca flour (or starch), which is naturally gluten-free. So I should be able to make them well by now. But the ones I have tried myself have been only serviceable. 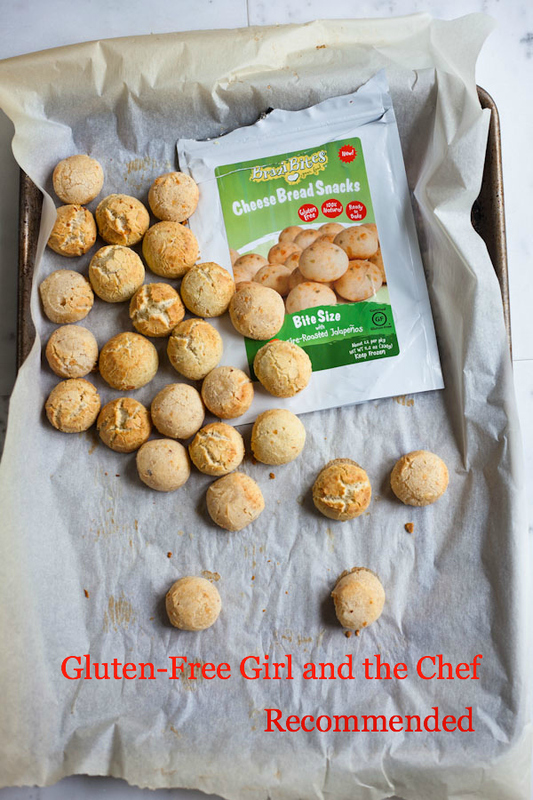 When I met Junea Rocha at a cooking class I taught in Seattle, I was thrilled to hear about the Brazilian cheese breads she had just started to market. Sure, I told her. I’d love to try a few. I’ll never make my own cheese breads again. Junea worked from the memory of the cheese breads her mother used to make in Brazil to recreate the flavor in Portland, Oregon. After a year of working, she and her husband found the right flavors and textures. They were a huge hit with everyone who tasted them, including us. Brazi Bites are now available throughout the Pacific Northwest, as well as online. Danny and Lu and I make these for a treat, to go with a bowl of tomato soup. Their small size makes them a little dangerous  it’s so easy to eat one after the other  but it’s the kind of danger you don’t mind. Warm crusty cheese breads, gluten-free. Heck yes. You could not have told me that I would crave gluten-free, vegan, raw treats. Most people hearing that set of words strung together might run away. Clearly, they have never tried the Hail Merry treats. The Hail Merry macaroons are my go-to snack when I travel. I tuck a bag of them into my carry-on bag and I’m good for those unplanned long layovers in an airport terminal with nothing gluten-free for sale. With all the ingredients organic and good for you (coconut oil, almond flour, shredded coconut, maple syrup), I feel great about giving these to Lucy for a treat after an hour at the pool. For a real treat, I love the raw tarts, particularly the Meyer lemon tarts. (Our lovely local store, Minglement, sells these in the refrigerator case.) Recently, Hail Merry added a line of nuts and seeds: salt and pepper sunflower seeds, maple-vanilla almonds, and seasoned raw pecans. We’re crazy about these too. Turns out that gluten-free, vegan, and raw can be utterly delicious. Danny or I cook dinner nearly every night of the week. We treat ourselves to one dinner out with Lucy per week, usually Friday evenings before movie night. (She’s crazy about old musicals. Tonight might be Seven Brides for Seven Brothers or Fiddler on the Roof.) But every other night, we’re cooking. Here’s the deal. We’re both at home for work. We cook for a living. And even we sometimes struggle to figure out what’s for dinner that night. For those of you with traditional jobs, more kids, a hectic commute, and soccer practice? Some good boxed gluten-free meal kits that cook up quickly might be just what you need. cooksimple is here to help you. I have to be honest: Danny was dubious. Boxed meals? How good could they be? But he agrees. These are good. Cowboy chili with cinnamon and quinoa. Punjabi curry. Skillet lasagna. Tibetan dal. Each of these meals uses good spices and flavors. Best yet, they’re all real ingredients. The Asian burgers contain: brown rice, gluten-free oats, sesame seeds, carrots, spices, sea salt, and dried onion, garlic, ginger, and orange peel. I like everything in there. If you are new to gluten-free and cooking both, cooksimple might be just what you need to start eating well and feeling comfortable in the kitchen. Finally, if you’d like to find out more gluten-free foods to buy, you can come back here in March. (We have great recommendations lined up for you already.) However, you can also go over to Taste Guru, a great new subscription site that will send you gluten-free foods. Taste Guru gathers some of the best gluten-free foods they find each month and deliver them to your doorstep. I have to admit that I love this description from the founder of Taste Guru: “Too many of the gluten-free products that he and his wife tried had the flavor of week-old cardboard  even many of the high-priced gourmet items tasted stale.” (Week-old cardboard might be my favorite phrase for some gluten-free foods.) These folks have discerning taste and they want to share it with you. If you want someone to guide you through the gluten-free food market, try Taste Guru. It might make a great gift for someone just starting out, too. We hope you’ve enjoyed this list of favorite sponsors. We also help you visit their websites and buy some of their food. We need to support the folks making good gluten-free food! And if you are part of a company making great gluten-free food and would like to talk with us about sponsorship, please send us an email at glutenfreegirlsponsors@gmail.com.